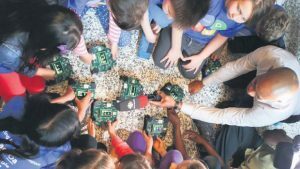 Elementary school students learn to program their own robots at Innovate U, a massive one-day STEM outreach event hosted at University of Toronto Engineering. U of T Engineering aims to spark a love of STEM disciplines in children of all ages and backgrounds, and helps deliver outreach programming to students from Toronto to Iqaluit. An innovative outreach initiative of University of Toronto Engineering, in partnership with the Toronto District School Board (TDSB), introduces coding basics to local teachers who can take those skills back to the classroom and use them to enrich lessons ranging from robotics to language arts. Antonio Santos, central coordinating principal for STEM K-12 with the TDSB, says he hopes the partnership will help the TDSB meet its goal to have all teachers in the Toronto area engaging students in coding, robotics and engineering. Mr. Santos also believes that enabling student visits to U of T Engineering helps students of all backgrounds connect their world with the university. “Exposing the younger students to the labs where they can see actual science being applied makes university seem like an attainable place rather than a place that is ephemeral and doesn’t exist except in the abstract,” he says. Coding and robotics also encourage computational thinking, working in groups and make the students better learners and problem solvers, says Mr. Santos. “Engineering is all about solving problems, and at U of T we are tackling global problems like access to clean water, traffic, access to safe infrastructure and health-care innovations. Working on these issues takes a global mindset,” says Ms. Britton. Engineering undergraduate students come from 75 countries around the world, and this year 39.6 per cent of the first-year class are women, says Ms. Britton. Diversity at U of T Engineering ensures wide ranging perspectives, and ideas are explored by the students as they study global issues.